I just discovered this site and I am glad I did. My Cooking Hut has a fantabulous (it is a word in my book) Cherry Tomato and Zucchini Tart. Slather some goat cheese on that bad boy and I'm dancing in the streets. I actually think that I'm going to move into this hut and wash down this tart with a little Blueberry and Pistachio Tiramisu. Word. Let us talk about the brilliance that is Cannelle et Vanille and her Pate Feuilletee that she turns into Raspberry Palmiers. Lets then discuss my inabilaty to pronounce the word feuilletee (I'd sound like the Friends Episode where Pheobe tries to teach Joey French). Let's do a little food magic shall we? No Recipes has an amazing (recipe) for Pastilla. Is it savory? Is it sweet? For something that "activates your sweet taste receptors" and the finishes with an "umami burst of flavour (with a "u")." Yeah, I'm in. Don't judge, but I don't think Milk Chocolate is that bad. Ok, judge. But then throw some truffles in that bad boy? Are you still judging? Check out Sophistimom for her Milk Chocolate Truffle Ice Cream and take those judgey-pants off. I know it is not a recipe, but I think I'll have to include new blog discoveries as well. There are so many great bloggers out there, and I have been very into food photography lately, so these sites really tickle all of my fancies. So what did I add to my Google Reader this week? Milk + Honey Cafe - A Canadian who moved to America who moved to Korea who moved back to America who moved back to Canada. And she is only 23. And an awesome food photographer. Bitchen Camero - Love the name. Love the photography. Love the site. That picture is starting to freak me out. Let's get to the goodies - all sweet things this time, my friends. The heart wants what it wants. If you've never been to Lemonpi, please check it out. If you've never made Mini Banana Streudels with Chocolate Sauce and Peanuts, please make me some and send them FedEx. Wait, I'm sorry, I lost track of thought. I was too busy salivating over Eat Me Delicious's Roast Banana Breakfast Pumpkin Bread. Carry on. Along the lines of breakfast breads that will make me fat and happy, The Wednesday Chef has posted Donna Dean's Pecan Brown Butter Bread. Pecans. Browned Butter. Loads of calories. Loads of fat. Loads of smiles. Can someone please help me find a Mary Ann Pan to make Baking Obsession's Lemon Cake with Lemon Mascarpone Dressing and Summer Berries? Please? With summer berries on top? Let's segue into more brown butter goodness (like what I did there? I took you from Bananas to Browned Butter, all in a few simple key strokes), lets take a lick - I mean look - at Travelers Lunch Box Browned Butter Ice Cream, shall well, hmmmmmmmmmmmmm? Joy the Baker brings a little joy to my life with Peanut Butter Fudge treats. Mention the combination of peanut butter and chocolate to me, and I go weak in the knees and loosen a notch in my belt. How about these Chocolate Shortbread Cookies with Truffled Chocolate Filling from Lisa is Cooking? I'll give you a minute to wipe the drool off of your chin. 9 layers of almond and citrus and jam and vanilla. This Neopolitan Cake from Smitten Kitchen doesn't have a Napoleon complex, that's for sure. Sigh. Bad joke. I'm all out of steam. Let's get straight to the good stuff. Check out Zoe Bakes for this unbelievable, plate-lickingly good chocolate cake. It looked so good that I licked my screen. It did not taste like the cake. In more chocolate cake news, Inn Cuisine has the most glorious Dark Chocolate Cake. Dark as night. Black as coal. I wanna see it, see it, see it, painted Dark Chocolate. I hope Mick Jagger doesn't get mad at me for changing the lyrics to his song. If he had a piece of this cake, I'm sure he wouldn't mind. Cookbook Chronicles has made it rain... ricotta nutella donuts that is. And I make it rain drool. Cookin' Canuck has made an awesome grilled shrimp pizza. I've never had grilled pizza, but these look like circles of deliciousness that belong in my belly. GET IN MAH BELLEH (throwin it back to Austin Powers). I want you to take a look at these 'Nilla Wafer S'mores over at the Hungry Housewife and tell me you don't want one right now. I wish I had kids so I had an excuse to make them and steal these from them watch them enjoy them. I'd climb the Rockies for a piece of this Grilled Elk with Quinoa Salad and Fiddleheads over at Healthy. Delicious. Because it is healthy. And delicious. Good blog name. Javaholic (love that name) has a watermelon and chorizo spanish tostada. Sausage makes everything tastes better. Even summer fruits. Let's talk Chicken Scallopini with Saffron Cream Sauce, shall we? Go ahead, I'll just be over at Little Bears Kitchen, staring at this amazing dish. I haven't cooked much this week - hence the lack of posting. I'll be back in top shape this weekend. But for now, lets drool together, shall we? For the Love of Food has the most gorgeous guava pastries I have ever seen in the flakiest crust . I have been obsessed with guava ever since my trip to Puerto Rico where they had the cutest little guava pancakes, that were more like a pastry shaped like a bundt cake rather than a pancake. But I still slathered them with syrup and ate them for breakfast. But back to these pastries. Guava. Yum. I don't know where I'd find guava paste, but when I do, my diet is in trouble. Jill's Blog has a recipe for Homemade Coffee and Vanilla Liquer. For all of us bakers and cooks that take pride in making everything from scratch, you can now make your own liquer. Now that's impressive. Hand me a glass. David Lebovitz is a pastry king. And I am a mere peasant who begs for a slice of his German Chocolate Cake. Lisa over at Lisa is Cooking has made the most delicious Zucchini and White Bean Puree. And guess what - I actually made it! And it was goooooooooood. A hit, if I say so myself. I didn't have truffle oil on hand (I am such a pauper), but I took down the garlic and topped it with sauteed mushrooms. Because I'm a cook like that. But Lisa is a GREAT cook like that for coming up with this one. Rhubarb used to scare me. I didn't understand it. To me, it looked like a discolored celery stalk. And who wants to eat celery in desserts? Well, now I do. And Maria over at Two Peas and a Pod has a slew of rhubarb recipes, thanks to rhubarb growing on her property (lucky!). My personal favorite? Strawberry and Rhubarb Crumb Cake. Don't worry, there is no celery in this recipe. If you want to check out the funniest food blogger in all the land, check out Cathy over at The Tortefeasor. If you want to check out the funniest food blogger in all the land making Ina Garten's Outrageous Brownies, check out Cathy over at The Tortefeasor. Now, I know a lot of people on the internet have posted these. But do they make you laugh when you post them? Because, you see, laughing burns calories. So these are actually brownies without the guilt. If you're from NYC, you know those people that sell Churros on the QNRW Platform at the 59th Street Subway Station sometimes. If you are not from NYC, there are some people that sell Churros on the QNRW Platform at 59th Street sometimes. Well, now you can make them at home - and they look better than any churros you can buy at any fair or subway platform. Eliana over at A Chica Bakes cooks up some gorgeous Churros. I'll take 5 for the ride. Cooking for Comfort has the most gorgeous, ooey, gooey Smores Bars I have ever seen. And really, when you get a S'Mores, you're looking for the ooey gooey. I am not kidding when I say I can actually taste them when I look at the picture. They're really good. Wendy at Pink Stripes has done the unthinkable. She has combined two Bread Bakers Apprentice Challenges into one. She has made Greek Celebration Bagels. And I did a little Teanna Celebration Dance when I saw it. Here's a little morself of creamy deliciousness that just popped up today - Jenn at Bread Plus Butter has made a creamy AVOCADO pesto. AVOCADO. My one true love. Then, to taunt me even more, she has spread that avocado pesto atop Mozzarella Tomato Sandwiches that are sandwiched with a cooked pizza dough. Droooooool. How about something a bit more impressive? Like Caramelized Scallops with a Smoked Chili Cream over at RecipeGirl. I know. I know. You can wipe that tear away. They really are that beautiful. Megan over at My Baking Adventures has another site called the brownie project. It was almost as if she started this project to answer my prayers for a site dedicated solely to fudgey, delicious brownies. Then she dug a little further into my prayers and made oreo brownies. Just for me. And for more proof that Paula Deen is trying to kill us: Heart Attack Burgers. I think you all know how much I love Nutella. Well, today, for me, is a federal holiday in the United States of Teanna. I owe great thanks to the geniuses behind World Nutella Day . Nutella is a chocolate-hazelnut based spread invented by the Italian company Ferrero (the makers of the also-famous Rocher chocolates) in the 1940s (HA! We DID come up with it! For many years, people attempted to claim that this treat was from Switzerland! Well, take that, Swiss, with all of your banks and neutrality and your delicious fish of the Swedish kind! Forza Italia!) Gianduja is a type of chocolate containing about 50% almond and hazelnut paste that was developed in Piedmont after excessive taxes on cocoa beans hindered the diffusion of conventional chocolate. Pietro Ferrero, founder of Ferrero, decided to sell this in block form and called it Supercrema. His son later decided to turn Supercrema into a spread, calling it Nutella. And for this, I am forever grateful. In honor of this day, I am going to post links to some of my favorite Nutella recipes. Please do try them. And please don't count calories. You seriously don't even want to know how many calories is in this stuff. But they don't count today because it's a holiday. Nutella Cheesecake Bars - These rich, creamy bites of Nutella and cheesecake goodness are not to be ignored. Self Frosted Nutella Cupcakes- you may have seen these on the Baking Bites website. Well, I made these for my Superbowl party, and they disappeared in about 5 minutes. Cupcakes and Nutella, combined for my eating pleasure? Yes, please. Oven Crespella with Nutella Sauce - I love this recipe. It is so easy to throw together (almost like making a sweet pancake batter, and it really puffs up in the oven) and my boyfriend always requests it. It comes together in about 10 minutes (not including baking time). The Nutella sauce is also great over ice cream. But I always omit the berries. I don't like berries messing with my chocolate. Chocolate Pizzelle Nutella Cookies - I love Nutella. I love Nutella on Ice Cream. I love Pizzelle with Nutella and Ice Cream. And if I can't get pizzelle, I love Nutella with Ice Cream on a Belgian Waffle. I love this recipe. That is all. (The picture alone will make you drool). Marshmallow Fluff and Nutella French Toast Sandwich - And that's all I have to say about that. Click here for an arsenal of Nutella recipes. Not for the faint of heart. Now, I know what you are thinking. This pizza sounds crazy. But let me tell you this. This is an unbelievably delicious, completely satisfying, and unique pizza. I saw this on Tastespotting maybe two weeks ago and have been itching to try it ever since. If I open a restaurant or find myself on Top Chef one day (because I could make scallops and gremolata and be a part of this cast. Even though this is "Top Chef, not Top Scallop! "), this is the type of thing I would make that would really make you go "hmm". And if you are making this for the non-adventurous eater ("Meat and potat"uh"s", as my father says), this would be one of those dishes where you tell them the ingredients after they try it (and fall in love with it). I made some changes to the recipe, but you really have to give credit to Mike at Mike's Table for coming up with this amazingly crazy recipe.The creamy pumpkin "sauce" along with the feta and chorizo and roasted squash was like nothing I have ever tasted before. The flavors were spicy and sweet, with a hint of pumpkin and warm flavors, and were complimented by the perfectly crunchy dough. I will be sure to make this again and again. First, prepare the pizza dough as that needs time to rest. In a small bowl, pour warm water (as in pretty warm, but not piping hot) and yeast. Let sit for 5 minutes until the water is cloudy or foamy. Mix remaining dough ingredients together. A food processor with a dough hook is definitely easier, but you’re welcome to use a hand mixer, too. Once the yeast is ready, add to remaining ingredients and mix well. The dough should naturally come together into a ball, being neither goopy nor overly tacky. If it is, add small amounts of water or flour to get the right consistency. Punch and knead the dough until it is smooth. Very lightly oil a bowl and place the dough in a bowl, covering the top with a towel. Let sit in a warm place for about an hour. After the dough has risen for an hour, cut it in two and form a ball out of each half and place these two on a lightly floured surface. Cover with a towel and place this back in your warm place again. Let the dough rise for an additional 45 minutes (the dough should roughly double in size). If using a pizza stone that requires heating, place it in the oven to heat. While heating the stone, rub a halved acorn squash with olive oil, salt, pepper, and let it roast in the oven. When fork tender (anywhere from 45 minutes to an hour), skin it, cube it, and set it aside. In a dry pan, toast the pine nuts for 2 minutes or so. Set aside. Remove chorizo meat from casing and brown for 7 minutes. Drain grease and set aside. Rinse the leek well and chop finely. Sauté the leek for 7 minutes or until tender. Set aside. Slice olives and set aside. Begin by dry toasting the pepper in a pan for a minute or two. Sauté the minced shallot in a bit of olive oil over medium heat for 6 minutes and then add the minced garlic for 1 minute more. Add the pumpkin purée to the pan along with the vegetable broth, herbs, and seasoning. Simmer for 5 minutes and puree in a food processor or blender. Return the sauce to the pan and continue to simmer for 10-15 minutes further until you reach your desired texture. Set aside. Finally, working quickly, toss your dough to the size appropriate for your pizza stone. Throw a generous sprinkle of cornmeal (to prevent sticking) or spray with vegetable spray, lay on the dough, ladle on the sauce, and toss on the toppings (if you have more handy than you can fit on your pizza, don’t overcrowd it–just hang onto it and eat them later). Bake this in the oven for roughly 20 minutes or until crust is golden. And maybe a clogged artery or two. Serious Eats has pulled off some of Paula Deen's Thanksgiving recipes from her website. Now, I love Paula Deen because I think she is hysterical and adorable, but seriously, she really is trying to kill us all. "Deep-Fried Stuffing on a Stick: Because everything is better deep-fried on a stick. Fried Pumpkin Layer Cake with Cream Cheese and Orange Frosting : Anything that involves two layers of battered and deep-fried pumpkin cake has to be good." You want a quick, filling and healthy dinner? Try this recipe out. It is so simple and fast, yet the variety of spices will really get your tastebuds working. 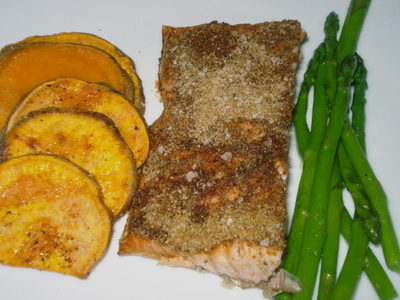 I like to make this with sauteed asparagus and cinnamon-sugar sweet potatos, but you can make this with whatever side you prefer. Preheat oven to 350 degrees Farenheit. Coat a shallow baking dish with cooking spray. Combine brown sugar, coarse sugar and cinnamon in a bowl. Slice sweet potato into 1/4" rounds. Place in a shallow baking dish and drizzle with vegetable oil. Sprinkle sugars evenly over potato slices, place in oven. Bake for 35-40 minutes or until sweet potatoes are tender. Preheat oven to 350 degrees Farenheit. Spray a shallow baking dish with cooking spray. Combine first six ingredients in a bowl. Rub mixture over salmon fillets. 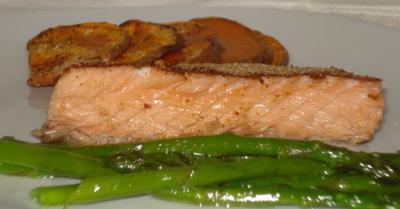 Bake salmon for 20-25 minutes (or until salmon flakes). Heat olive oil in a saute` pan over medium heat. Add asparagus and a pinch of kosher salt. Saute` for three minutes. Lower heat to medium low and add enough water to just cover the bottom of the pan. Cover and cook for additional 5 minutes or until tender. Drain water, drizzle with olive oil and add coarse sea salt and freshly ground black pepper to taste.